It has been a while since I have posted anything. Our family was watching the movie "One For The Movie," when there was a cafe or restaurant scene. The waitress was wearing a blue floral apron. I did a double take, and said, "I think that I made that apron." They had a closer shot, and I knew that it was something from Country N' More, so I checked my records, and sure enough, it was one of our aprons. You can imagine how ecstatic I felt seeing the apron in a movie. I remember the customer telling me back in 2010, that the apron was for a movie, but she wouldn't reveal the name of the movie. Here is the apron. The picture makes the fabric appear to be darker than it really is. 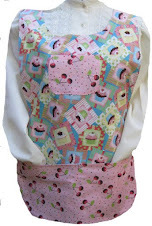 Of course with the cobbler aprons from Country N' More, there are two sides. The production company chose to just use one side. The above picture is the side that they chose not to use.